My name is Elizabeth and my sister’s name is Georgia. When I was a little girl my Papou (grandfather) shortened Elisaveth (Elizabeth) to ‘Sava’, so I use that for anything creative I put my name to. When she was a teenager, my sister decided she needed a nickname and christened herself ‘Jo’, insisting she would answer to nothing else. She has eased up on that rule, but I still call her Jo more often than Georgia, unless I am speaking Greek. Then she is Yeoryia. 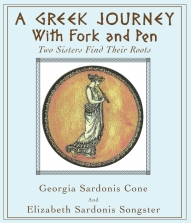 Our husbands are Dan and Floyd, but when we got to Greece the first time, we gave them Greek names: Dan=Niko, Floyd=Stavro. Our kids think we are very funny. This is so great!! Harladambos Greek name for Hampton. Of course Bruce has Petros. Go figure. Harladamos sounds like it should be an ancient Greek God’s name. I didn’t think Hampton was the ‘usual’ Greek name, is it? Really, go figure! Gotta love it. Thanks for checking us out! Correct, not the ‘usual’ greek name. However, I can live with the Greek God part!! Dear Clare, Thanks for stopping by and sharing my mother’s stories. You have a great memory. Her father was the baker and we called him Papoulie Petro. My Dad’s father gave me the nickname, Sava and he was just Papou or Grampy. We have fond memories of both our Papous. Trio… I thought you’d be OK with that!! Cabbages are magic.. thank you Dan..quite the lure.. In my children’s garden, “small packages “are found under cabbages! perhaps in my new children’s garden, in Maine, I will start with a petite chou-fleur!I will send this on to our second favorite family culinary expert..Yaya, Helene, being the first.. Jamie being the heir apparent. the cabbage recipe looks fabulous – my German husband actually routinely requests that I try cooking it for him (he looks longingly at all the cabbages at the Safeway when we go shopping as a family and makes comments like “wouldn’t it be nice to eat something different????)…. and I find I am typically at a loss (and default to broccoli or green beans) as German food is most definitely not my area of expertise… now I can make “Greek Cabbage”… anything with olive oil and lemon (or spinach and feta) is automatically labeled “Greek” in our house! Hi Jamie, I hope you and your husband like the cabbage recipe. Lemon and olive oil always bring out the best in many veggies. You can try it with beet greens, escarole, kale, any ‘greens’. In fact, if you substitute apple cider vinegar (my personal favorite) for the lemon you will get another fabulous taste sensation. Green beans with vinegar, olive oil and Greek oregano is a wonderful easy side dish, too. Look at that… 4 new/different things you can try besides the cabbage. And speaking of spinach, you can do the same with boiled spinach. I like the vinegar with that! I think I’ll have to run to the kitchen and cook one of those for tonight! Love it~Thanks for stopping by. cabbage being your inspiration. Hah! I can picture it. Especially if your cottage in Maine is the backdrop…OK, crashing waves on rocks and your petite chou-fleur as your inspiration! I’ll come cook the cabbage while you write, OK? Love the idea. Yia sou, Mary, and YOUR new beginning! Do come back soon. Sava, wonderful website! The photos are superb and the design is pleasing to look at. I’m hungry! We have lemons in the back yard. I’m making the soup first. What is my Greek name, and is Elena also Elena in Greek? Elena of Troy? Hi Elizabeth! Not sure about the recipe, since I don’t do a lot of cooking… but couldn’t resist checking out your site. Love it! I just read your book cover to cover and have many questions about your wonderful adventures and tasty food. AND as I sit at my desk I am eating the Greek green bean and potato stew I made last weekend!!!! Loved your book. (obviously!) Janni and I want to come visit and get personal autographs. Anytime next week after school? I am a producer at Channel 3 and would love to contact you both about doing a live interview for the 5:30 program, The :30. If you are interested, please email my address provided. Hopefully we’ll be in touch! I own a bookstore in Barre, VT, and would like to stock your cookbook. Please call me ( 802-476-3114) or email me ( Cynthia@nextchapterbooksvt.com) to let me know how I can stock this. Greetings from Nashua! What a wonderful article in yesterday’s Telegraph telling us all about your cookbook. Very interesting to have a story with each recipe, a nice touch. As for your tomatoes…..the creature is a chipmunk. The fruit gives them the water that they need. We have them all the time, and are willing to share the fruit with them. Our church, St. Philip, has an annual food festival every May (next year May 16 & 17). Our festival chairwoman, Jamie Pappas will be in touch with you and we would love to have you come and do a book signing. Please give it some thought, it would be so nice to have you there, but I can’t wait til next year, I am ordering 2 books for me and my sister Nancy today! We loved the article Dean Shalhoup wrote in the Telegraph, too. Thanks so much for buying our book. We really appreciate it. I hope you enjoy our journey! It would be great to come to next year’s festival, but it will depend on what is happening at the time here in California. Thanks for the tip on the tomato bandit…just one problem…we don’t have chipmunks here in Southern Ca!! We haven’t been bothered for a few weeks now so maybe whatever it was has left the area!! Hope so! Anyway, keep visiting my blog for more recipes and “chit-chat”! Thanks again. Please let me know how you like the book! Yassou! Is there any way to get a map of your travels from Island to Island (and villages) in the book. We are reading for book club and would really appreciate a visual accounht. Hi Linda, I’m thrilled to hear you are reading it for book club! On page 38 there is a small map of our itinerary but it is not in detail. It just gives a general idea of our travels. You would have to get a map from Amazon, probably or online. I’m sorry I didn’t see your comment sooner. I usually get an email telling me there is a comment but didn’t. Anyway, I hope you all enjoy it. Where are you located? ?